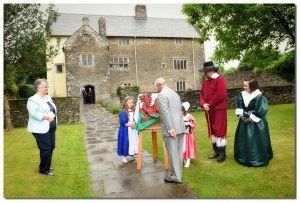 372 years after King Charles I visited the Manor during the Civil War in 1645, HRH Prince Charles followed in his ancestors footsteps to formally open the new orientation exhibition at Llancaiach Fawr. The opening of the exhibition marks the culmination of a Heritage Lottery Fund ( £943,200), Cadw ( £30,000), Caerphilly County Borough Council (£65,000) and the Friends of Llancaiach Fawr (£14,000) funded project. The project was devised to improve the interpretation of the Manor by completing the period feel of the interiors, creating the servants quarters in the attics, building an accessible staircase tower and creating a new, bilingual exhibition to tell the wider story of 4000+years of occupation on the site. The Visitor Centre exhibition introduces visitors to the Prichard Family, the estate and the background to the Civil War using traditional and modern techniques including portraits of Charles I and Oliver Cromwell discussing how the war started, an interactive touch table with games for younger visitors and an archive of documents for history buffs. Objects discovered on site are on display for the first time and include a hoard of children’s shoes deliberately placed under the Grand Staircase during the 17th Century and a votive hoard of personal items, including human hair, which was secreted in a niche in the back of the Servants Hall fireplace. External interpretation panels cover the building conservation project, the archaeology of the site, the agricultural traditions and the history of the later occupiers using historic images and audio posts so that visitors can hear stories relating to Llancaiach Fawr. 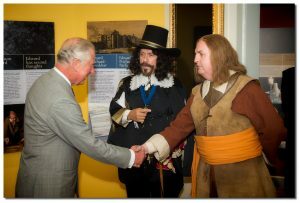 HRH Prince Charles was introduced to the staff and specialist team who created the new exhibition and met his ancestor in the person of Mark Wallis of ‘Past Pleasures’ who portrays Charles I annually at the Manor on Kings Day in August. During a brief tour of the Manor HRH Prince Charles was taken back to 1645 by the servants who regaled him with tales of their lives living in the Colonel’s household. He met the architect and builder of the staircase tower and had the opportunity to discuss the importance of keeping historic buildings in use with Sally Edwards, committee member of the Heritage Lottery Fund in Wales, whose support was vital for the whole project. The visit ended with a tour of the period gardens at Llancaiach, including the kitchen and physic gardens and the orchard of historic apple trees. HRH Prince Charles was presented with a bread board and cheese board made from the oak from the Usk Valley used in the attics during the conservation works and a handstitched quilt made by Anne James of the Ystrad Mynach Quilters. The gifts were presented by the youngest members of the costumed team of interpreters, Hannah and Louisa Mears who play the roles of Jane and Mary Prichard- the daughters of Colonel Prichard in 1645. Diane Walker, General Manager of Llancaiach Fawr and Project Leader for the building conservation works and new exhibition said, “It has been wonderful to share this beautiful and fascinating place with HRH Prince Charles and it has been an honour that he has opened our new exhibition. The staff here and the project team have worked so hard to create an experience that we are very proud of and we look forward to welcoming new and returning visitors to see what we have achieved”.